Regarding the Pain of Others begins with an example of differentiation. Sontag reminds us about Virginia Woolf's Three Guineas published in 1938, but written during the previous two years, in the climax of the Spanish civil war. The book was Woolf's reflection on the roots of war, a reply to a letter from a prominent London lawyer asking her "How in your opinion are we to prevent war?" In Three Guineas, Woolf took a feminist position - it is not my war, she wrote, it is yours - the men's war in your men's world. "The killing machine has a gender, and it is male," she said. How do we perceive the images of war from our personal position of men, women, mature or young, educated or not enough, Americans or others, relatives of the victims or strangers? No "we" should be taken for granted, writes Sontag, when the subject is looking at other people's pain. The child killed by bombs is neither "Palestinian" child nor "Bosnian" nor "Jewish." The photographs of starving children in occupied Biafra, published in the late sixties in the London's Sun, were not disturbing images of dying "African" children. For all who saw them, the suffering and death was simply children's. And because they were children, without any adjective attached to this word, these photographs, circulating the globe, aroused one of the biggest and bravest humanitarian actions in history. As Philip Gourevich wrote recently, the pictures from Biafra helped spread forth the growing wish of the West to find a way to seek honour on the battlefield without having to kill for it. 1 Thanks to the modern techniques of picturing and image distribution, we are reminded, more and more often, that pain is universal and that evil is real. Pictures bring victims' suffering near to us. They should make us engaged with the pain of others. Sontag's book is an attempt (but not only this) to solve the problem of distance between us and the pain of others imprinted on photography and film; or if not to solve this distance at least to understand it. Such an attempt is important and noble, because in our world of overflow of images and screens, of information chasing the calamity on its heels, we are really threatened to lose our sense of reality, or worse, to lose our sense of sympathy towards the people who suffer. I am reminded, now, about Adam Smith, who is popular today only with his theory of the "invisible hand of the market" from his book The Wealth of Nations, and unfortunately less known with his magnus-opus The Theory of Moral Senses where he placed the feeling of sympathy in the center of social gravity. Once we lose our sense for sympathy, we lose our humanity. In Regarding the Pain of Others, Sontag is alerting us about the dangers of the wearing out of our moral feelings. She does not argue that the realities of war and violence must be kept in secret, but she explores this particular and very possible moment when the witness of other people's pain gets so used with atrocity that his moral sense and will to act is overcomed by apathy and inaction. The danger of image "oversaturation" is a modern phenomenon. It is an inversion. Until the 19th century, the majority of people did not see the horrors and misery of war, for them the picture of war was romantic, the battelfields were distant in space and in time, war for them was a tale of heroism and honour. They were unaware of the terrible reality of war. We can excuse their naïveté, they were victims of national propaganda and education. One of the greatest examples of the results of state propaganda, prising war as heroism and sacrifice for the good of community, was the public excitement that preceded the beginning of the First World War. In 1914, after nearly hundred years of peace, Europeans did not remember what war was. Moreover, they were thaught to believe that it is something good. Today, the images of military violence are everywhere. We know what war is. The images incited the vigorous public opposition against the war in Iraq, they played a huge role in anti-war sentiments in the 60s and the war in Vietnam, but they also helped the spread of apathy. Today, we are radiated by a constant flow of pictures and visual reports of scenes of bloodshed in the Middle East and Africa, supplemented by the virtual reality of war movies and computer games. The overexposure makes us, again, to forget or to want to forget that violence and suffering are real. A woman from Sarajevo shared her war experiences with Sontag. 3 She told her that seeing the destruction of nearby Vukovar on the TV, she thought to herself "O, how horrible!" and switched the channel. 4 Not after long Sarajevo was destroyed by the Serbian army. Is it normal to "switch the channel"? It is normal in some cases. But unfortunately it becomes a normality. We can switch the channels, because we feel helpless to do anything, because we are afraid and disturbed, or just because our helplessness and fear has grown into apathy. Constant picturing, showing an unstoppable war, might teach us of quiet, self-imposed ignorance and detachment. I remember how angry I was in the very first days of the Gulf of Mexico oilrig disaster. I followed the news daily. And day after day I heard repeating bad news - reports for growing amount of oil spilled in the ocean, revelations of BP's lies, governmental inaction, and numerous, unsuccessful attempts to tap the gusher. After nearly two and a half months of full emotional engagement, I felt fatigue. I was not able to do anything to help, now, I just resigned emotionally. The disaster was unstoppable. So, in response, I stopped following the news. My anger dissipated, replaced by apathy. The massive media exposure to reports of unpunished and ceasless atrocities might lead us to moral resignation. The images of war should have the opposite effect of creating apathy. Sontag noted that in the long history of art we can hardly find paintings of suffering from natural causes such as illness or childbirth. Suffering, depicted in the visual art and media, is caused almost always by "wrath, divine or human. "5 Non-natural suffering is preventable, and because of that, its images have the aim to shock us, to awake our moral feeling. Showing atrocities is to invoke indignation and if possible to trigger action to prevent evil. There is a moral appeal in this. Sure, there are also temptations the images to be used as propaganda and manipulation, but generally, the visualization of suffering is against evil, it aims to invoke our good, human side and will. The actor George Clooney said recently in an interview for BBC, that he is a man who is constantly, "fortunately and unfortunately," in front of the camera. So he decided to go to the "darkest places" in the earth (an echo of Conrad's journey to the "heart of darkness" or Africa) to make them visible. Clooney is popular with his advocacy for resolution of the Darfur conflict and his humanitarian work. It is right and our duty, I think, to bring camera in dark places. 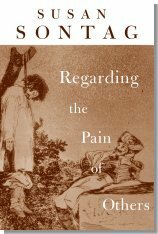 It won't be a "colonial reflex," as Sontag calls the inclination of showing human suffering in exotic places far from the civilized world. It would not be if we show also the "unpatriotic" images of pain in the dark places of our own society. The pain of others must be exposed and made felt for all who are in "safe." The image of suffering, photography or movie, is a memory that speaks directly, and it speaks in one language to all generations. The danger of exhaustion from the overflow of images of victims of violence is always present, it cannot be evaded in modern world and it should not be treated with artificial measures of media control. Like engagement, exhaustion cannot be a permanent human state. More importantly, despite the risks involved, our duty is not to close eyes for the pain of others. This is, I think, Sontag's conclusion and this is my own, too. 2 Susan Sontag, Regarding the Pain of Others (New York: Picador/Farrar, Straus and Giroux, 2003), p. 42. 3 Susan Sontag staged Beckett's Waiting for Godot in the summer of 1993 in besieged Sarajevo. She spent in Sarajevo much of the time between early 1993 and 1996 and was made an honorary citizen of the city. 4 Susan Sontag, Regarding the Pain of Others (New York: Picador/Farrar, Straus and Giroux, 2003), p. 100. 5 Susan Sontag, Regarding the Pain of Others (New York: Picador/Farrar, Straus and Giroux, 2003), p. 40.